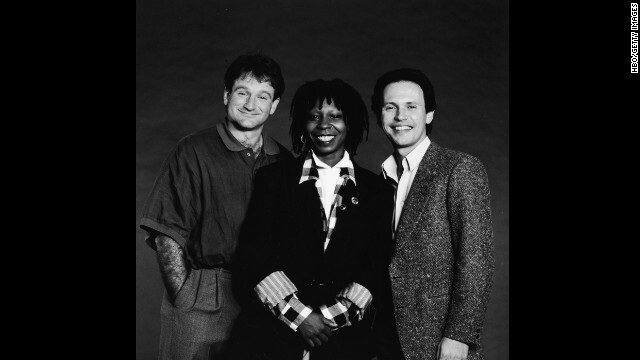 Robin Williams was honored during this year's Emmy telecast with a tribute led by friend Billy Crystal, who hosted the "Comic Relief" benefits with Williams and Whoopi Goldberg (seen here in 1986). Williams died August 11 at age 63. Click through to see moments from the beloved actor's remarkable life. 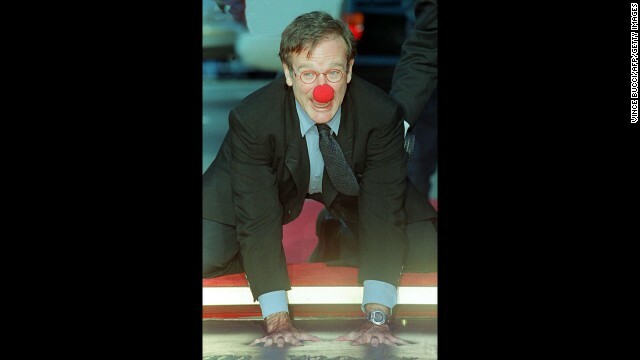 Williams' peers regarded him as a brilliant actor and comedian. His friend David Letterman remembered him as "nothing we had ever seen before." 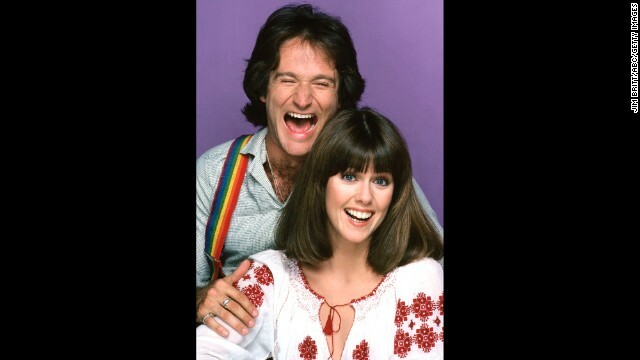 Williams first shot to stardom with Pam Dawber in the sitcom "Mork & Mindy" in September 1978. 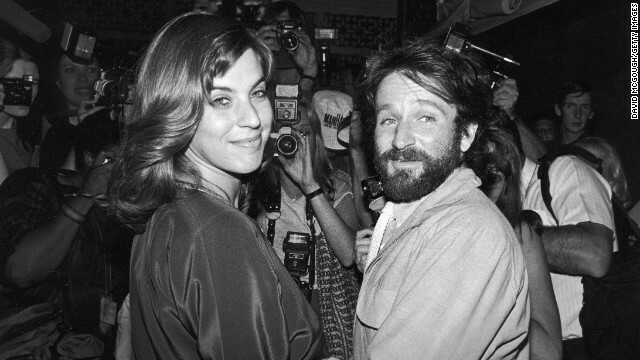 Williams attends the Robin Williams Opening Party on April 11, 1979, at Studio 54 in New York City. This 1982 file photo originally released by Warner Bros. Pictures shows Williams as T.S. Garp from the film "The World According to Garp." Williams and his first wife, Valerie Velardi, join a huge number of photographers packed into singer Paul Simon's apartment to celebrate Simon's wedding to actress Carrie Fisher in New York City on August 16, 1983. 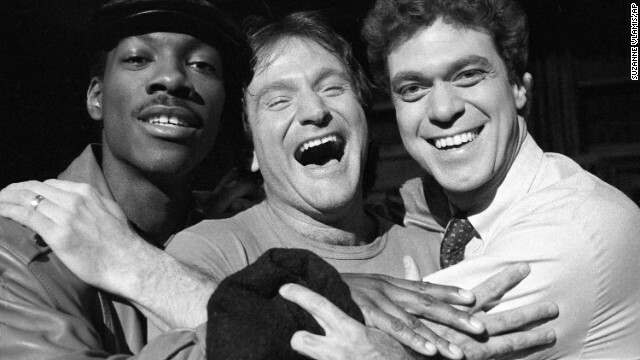 Williams, center, takes time out from rehearsal at NBC's "Saturday Night Live" with cast members Eddie Murphy, left, and Joe Piscopo on February 10, 1984. Williams would appear as guest host on the show. 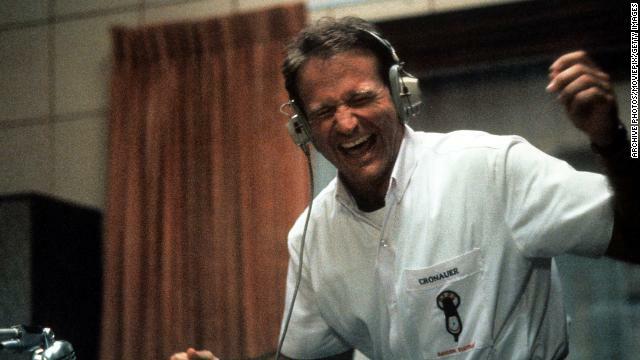 Williams enjoys music through a headset in a scene from the film "Good Morning, Vietnam" in 1987. 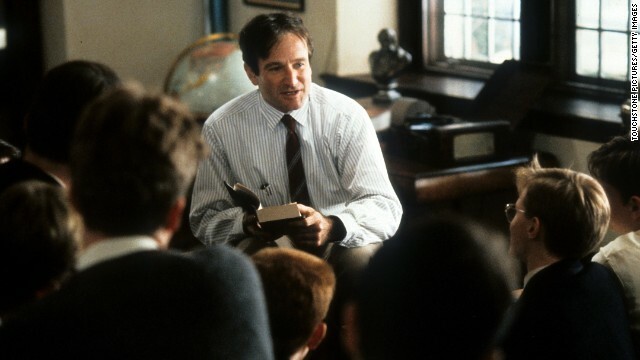 Williams portrayed a teacher in the movie "Dead Poets Society" in 1989, one of his first mostly dramatic roles. 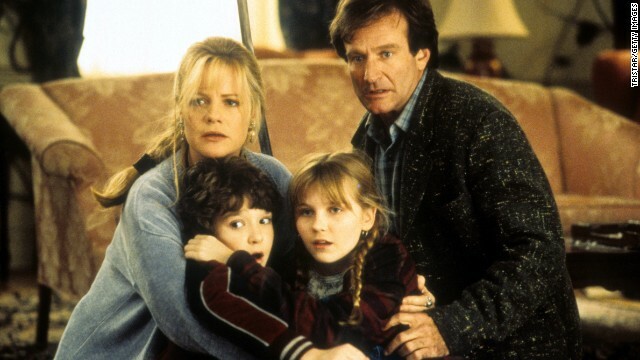 Williams went to all lengths to stay with his children in the 1993 movie "Mrs. Doubtfire." From left, Bonnie Hunt, Bradley Pierce, Kirsten Dunst and Williams hold one another in a scene from the 1995 film "Jumanji." Comedians and co-hosts, from left, Billy Crystal, Whoopi Goldberg and Williams sing and dance the 1940s-era opening number to "Comic Relief VII" on November 11, 1995, in Los Angeles. Jay Leno laughs as Williams jokes around during a taping of "The Tonight Show with Jay Leno" on November 13, 1995, at the MGM Grand Hotel in Las Vegas. 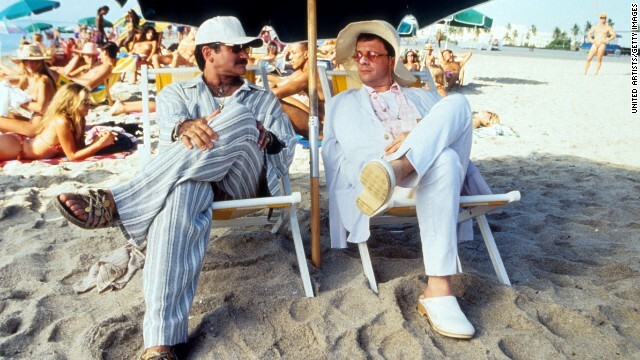 Williams and Nathan Lane starred in the film "The Birdcage" in 1996. 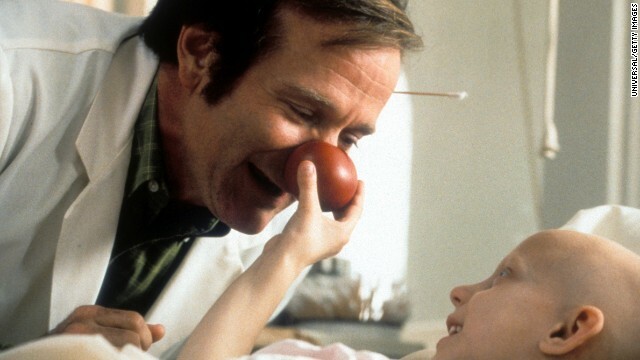 Williams visits a sick child in a scene from the film "Patch Adams" in 1998. 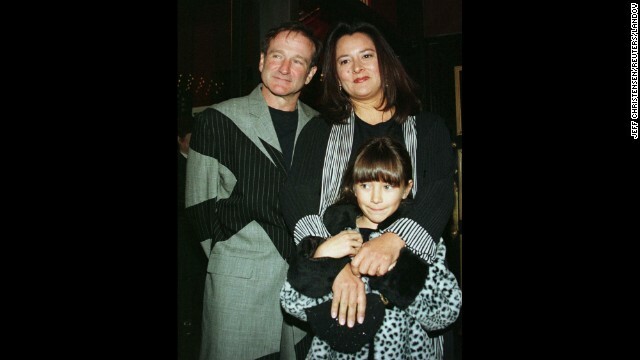 Williams and his wife, Marsha, pose for photographers with their daughter, Zelda, as they arrive at the premiere of the film "Patch Adams" in December 1998 in New York City. 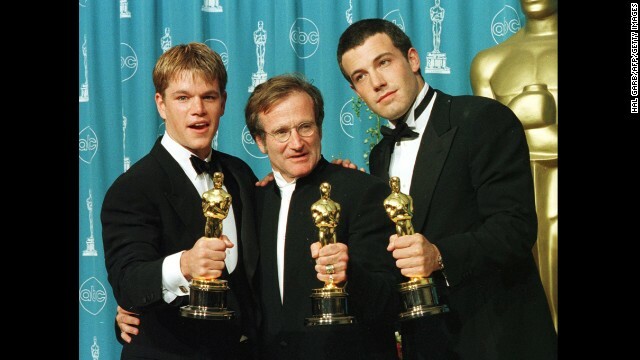 Actor-writers Matt Damon, left, and Ben Affleck, right, pose with Williams, holding the Oscars they won for "Good Will Hunting" at the 70th annual Academy Awards in 1998. Damon and Affleck won for best original screenplay, and Williams won for best supporting actor. 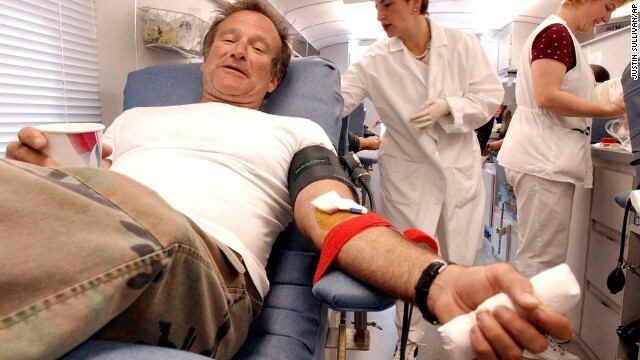 Williams donates blood at the Irwin Memorial Blood Center in San Francisco on September 11, 2001. U.S. 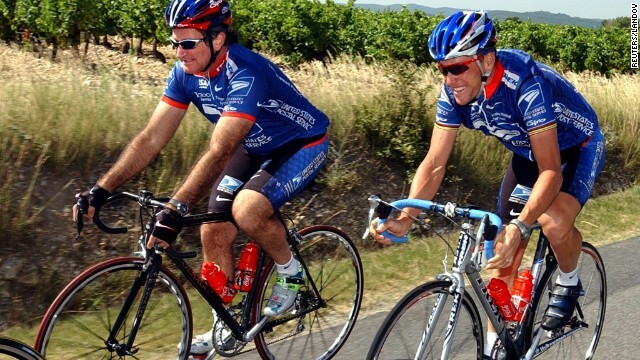 Postal Service team rider Lance Armstrong rides with Williams during training on a rest day of the 89th Tour de France cycling race in Vaison La Romaine on July 22, 2002. Williams plays Rainbow Randolph in the 2002 black comedy "Death to Smoochy." 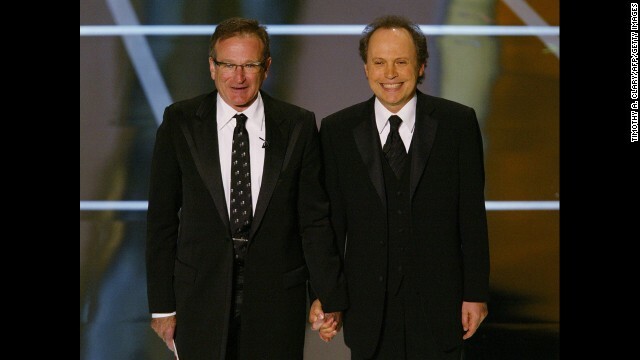 Williams and Oscar host Billy Crystal perform at the 76th Academy Awards show in 2004. Williams poses for pictures with U.S. soldiers at the main U.S. base at Bagram, Afghanistan, on December 16, 2004. Williams in 2007's "License to Wed."
Williams and Susan Schneider arrive at the premiere of "World's Greatest Dad" in Los Angeles on August 13, 2009. Williams at the pre-premiere party for "Happy Feet Two" at the Grand Connaught Rooms in London on November 20, 2011. Williams poses for photographs in Sydney, Australia, on December 5, 2011. He and Australian director George Miller were in Australia to promote "Happy Feet Two." Williams' wife, Susan Schneider, said, "This morning, I lost my husband and my best friend, while the world lost one of its most beloved artists and beautiful human beings. I am utterly heartbroken." Share your memories of Robin Williams. (CNN) -- There didn't seem to be too much that Robin Williams couldn't do. As an actor, he had the range to go from playing a loveable alien on the small screen in "Mork & Mindy" to winning an Academy Award for his portrayal of Professor Sean Maguire in "Good Will Hunting." Whether it was spastic slapstick or heart-rending drama, the actor, who died on Monday from an apparent suicide, was as prolific in his career as he was hilarious. Evidence of that work ethic won't end with his death. There are four completed Williams films expected to be released posthumously: "Night at the Museum: Secret of the Tomb," "Merry Friggin' Christmas," "Boulevard," and "Absolutely Anything." Given his love for his craft and his fans, the final work feels like a gift left behind by the beloved actor. "In one two-year period I made eight movies," Williams reflected. "At one point the joke was that there's a movie out without you in it. You have this idea that you'd better keep working, otherwise people will forget. And that was dangerous. And then you realize, no, actually if you take a break people might be more interested in you. Now, after the heart surgery, I'll take it slow." Set for release in December, "Night at the Museum: Secret of the Tomb" saw Williams revisiting his role of Teddy Roosevelt, which he had portrayed in earlier films in the series. "There really are no words to describe the loss of Robin Williams," said a statement from 20th Century Fox, the studio behind the movie. "He was immensely talented, a cherished member of our community, and part of the Fox family. Our hearts go out to his family, friends and fans. He will be deeply missed." Williams also completed a role in the holiday comedy "Merry Friggin Christmas," which is set to be released in November. The film centers around father Boyd Mitchler, played by Joel McHale, who realizes he has left behind his son's gifts while on holiday with his estranged family. Williams stars as McHale's father, who makes the trek with him to retrieve the presents in time. "When you talk to Robin you think, 'I have learned more in the last 20 minutes than I ever learned,'" McHale told the New York Daily News earlier this year. "He is such an open soul and one of the most sensitive and great guys..."
Known for his voice work in films like Disney's "Aladdin," Williams provided the voice of Dennis the Dog in "Absolutely Anything," which will be released in 2015 and costars Kate Beckinsale and Simon Pegg. But it is his role in the drama "Boulevard," which premiered at the Tribecca Film Festival in April, that may become the most discussed and heralded of Williams' final films. 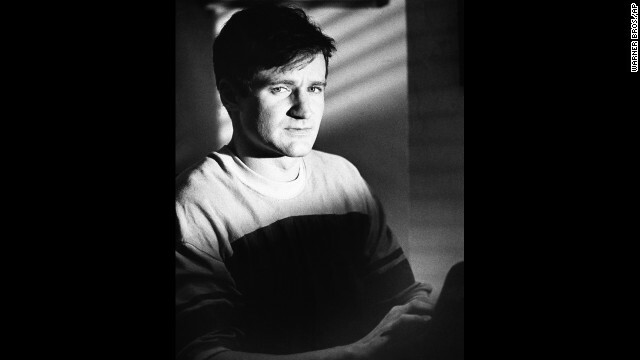 "Tapping into that same loneliness felt in 'One Hour Photo' and 'Good Will Hunting,' the actor projects a regret so deep and identifiable, viewers should have no trouble connecting it to whatever is missing in their own lives — whether those regrets are romantic, sexual, professional or spiritual," critic Peter Debruge wrote in a review of the movie for Variety. 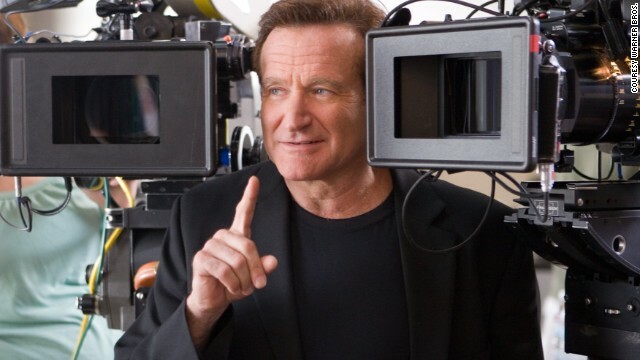 During a Reddit "Ask Me Anything" session with fans in 2013, Williams said he couldn't choose between comedies or dramas. "I like doing both comedies and dramas, so it's very difficult to say which one I prefer," he said. "I've been very blessed to have had the chance to explore such a variety of characters." Robin Williams, who first made America laugh and eventually touched "every element of the human spirit" in a remarkable range of performances, died at age 63. See our complete coverage as we remember comedian and actor Robin Williams. Watch and remember the career of Robin Williams by revisiting some of his best moments from stage, film, and television. 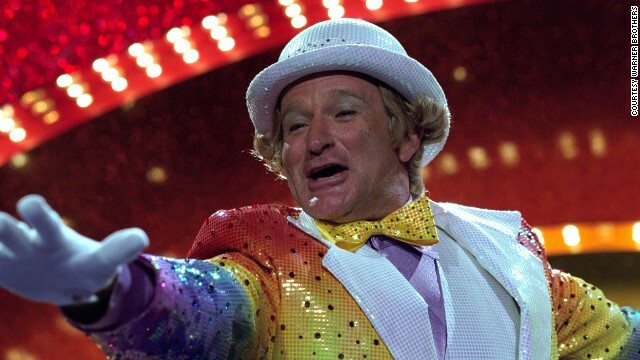 Click through our gallery of Robin Williams and his memorable roles. Robin Williams was sober, but was struggling with depression, anxiety and the early stages of Parkinson's disease when he died, his widow said. 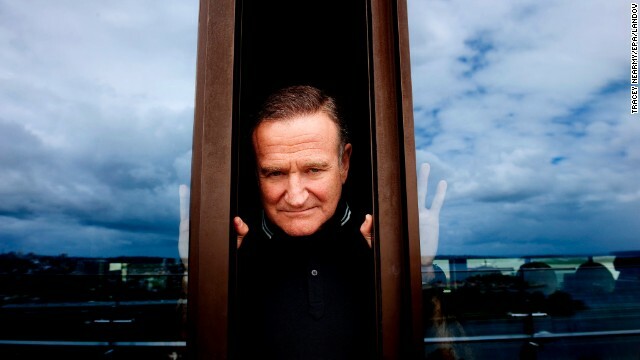 Robin Williams was in the early stages of Parkinson's disease when he died. What is Parkinson's disease? Robin Williams gave a lot of advice and his words carry as much power now as they ever did. Of all the things to say about Robin Williams, the truest may be this: He made people smile. 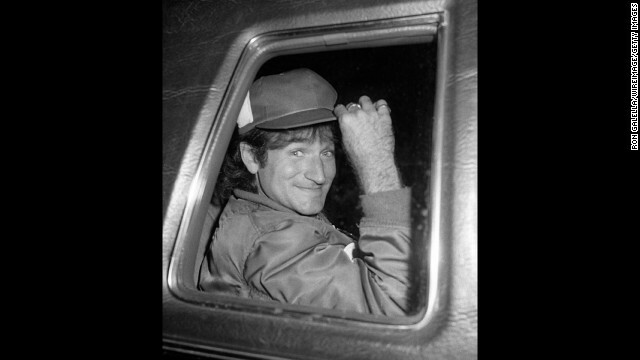 Robin Williams delighted fans with his off-the-wall, high-energy comedy that took unexpected turn after unexpected turn. A collection of some of the beloved comedians' more colorful stand-up moments throughout the years. Before Robin Williams, there was Jonathan Winters. Robin Williams touched more people emotionally than he will ever know. 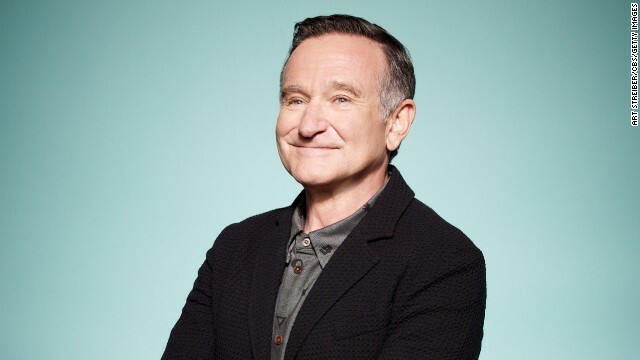 Robin Williams was not only known for bringing laughter to so many throughout his career but for bringing compassion to his philanthropic causes as well. There didn't seem to be too much that Robin Williams couldn't do. 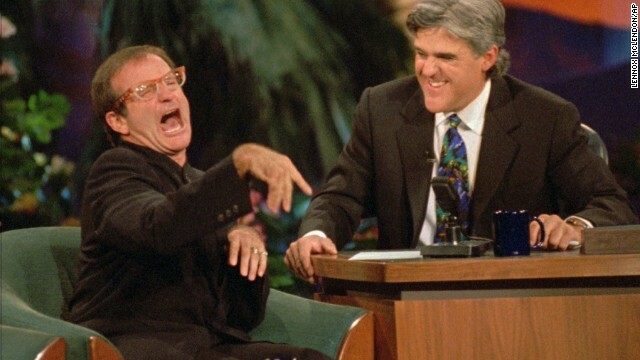 There was never a dull moment when Robin Williams sat in the guest's chair. Here are some of the best. 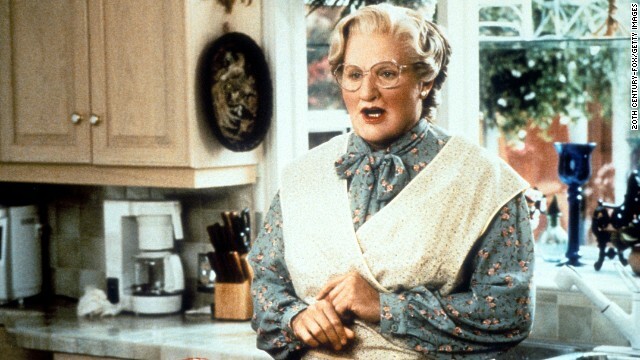 Robin Williams, who died Monday at age 63, was Peter Pan to some, Mrs. Doubtfire to others, and a beloved actor to many. Here's a look back at some of the more than 100 movie characters that actor Robin Williams brought to life. If there was any actor who could make the entire family laugh, it was Robin Williams. As a medical student who used humor to help his patients, Robin Williams' role in "Patch Adams" was touching and memorable. 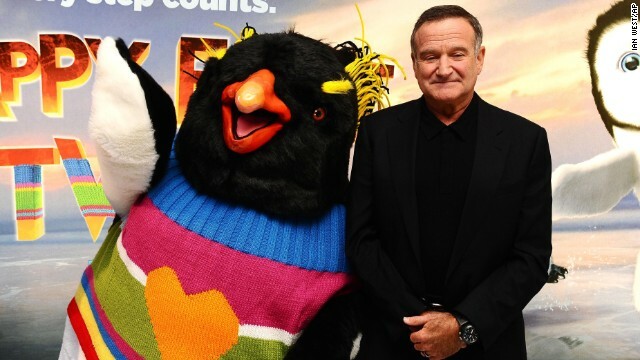 Robin Williams and other comedians who were gone too soon. 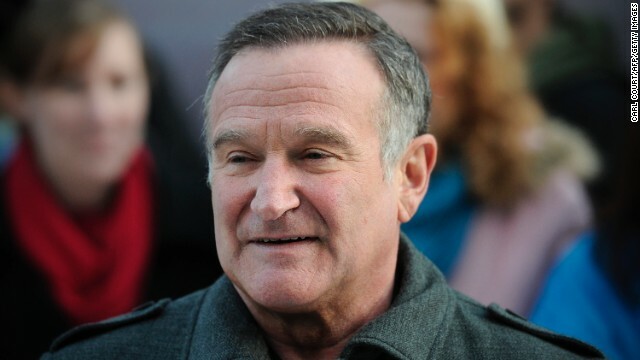 Comedic actor Robin Williams died at his Northern California home. Here's a look at some moments from his acting. 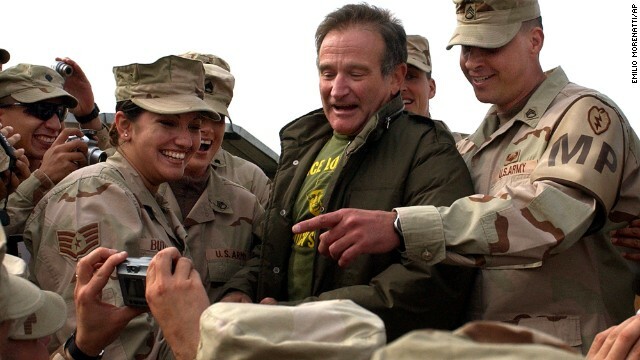 Over the years, Robin Williams entertained nearly 90 thousand troops in 13 different countries with the USO. The more people share their experiences with depression, the more others suffering from the condition realize they're not alone, says Kat Kinsman. He could do 'em all! Check out some of Robin Williams' best impressions. 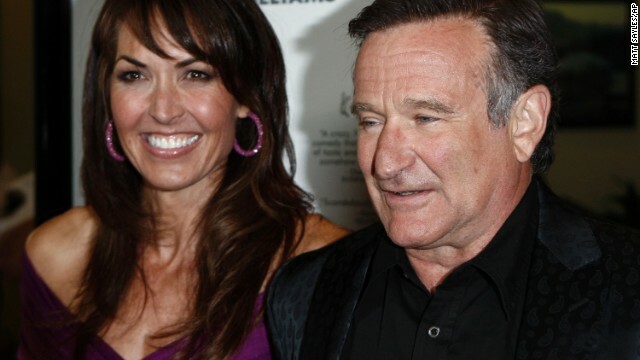 Video: A statement from Robin Williams' wife confirms: "This morning, I lost my husband and my best friend."